Historical photographs of Fort Wayne people and places, especially from the 1860s, are exciting when they become available, and it is especially fortunate when they have some identifying information. So many photographs with Fort Wayne photographer imprints appear at auctions and estate sales without any identifying information of the subjects, and without it, they are of little use to historians or genealogists. Occasionally, though rarely, a caption on such a photo can be misleading. Recently, a local collector shared with both the History Center and Genealogy Center a digital scan of an unusual carte-de-visite image he had purchased on EBay. 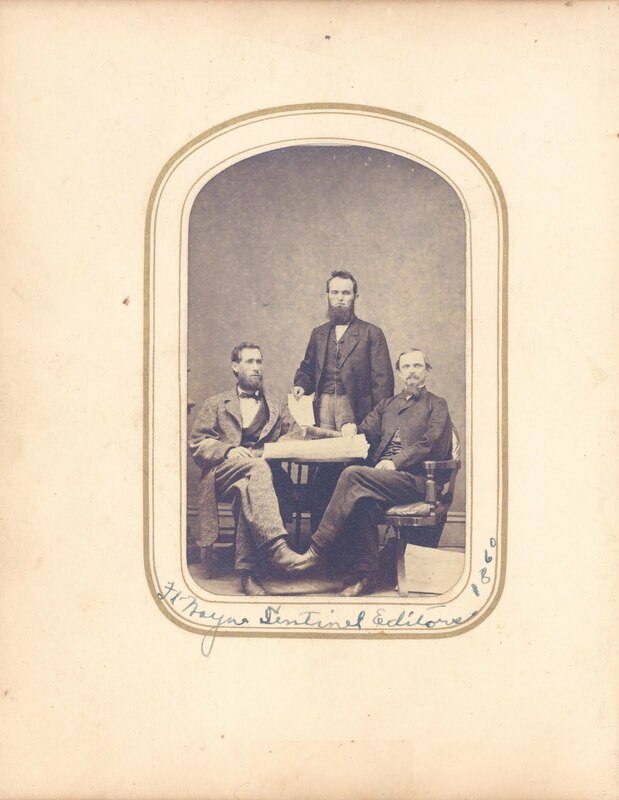 It depicted three men holding several bound newspaper volumes and a handwritten inscription: "Ft. Wayne Sentinel Editors 1860." The find was exciting for me personally, for when he showed it to us, I was at work on an article for the Old Fort News about Stephen Douglas and his campaign appearance in 1860. The editor of the Fort Wayne Sentinel, Thomas Tigar, had played a key role in that event. The picture would have made a wonderful illustration for the article. Closer examination of the image brought several potential problems to light, which led us to doubt the accuracy of the caption. First and foremost, none of the three men in the photo resembled Tigar, who had a very distinctive face. Second, a close examination of the digital image showed that the spines of the bound volumes did not depict the Sentinel at all, but instead showed Dawson's Fort Wayne Weekly Times. John W. Dawson, editor of the Times, was Tigar's chief competitor and had endorsed Lincoln in 1860. His face is also well known, and none of the three men resembled him, either. We had to do even more detective work to identify the image. Printed on the back was the photographer's label: "Specialite. J. A. Shoaff's Art Gallery, No 8, Corner Main and Calhoun." Fort Wayne's city directories exist in an almost complete run for most years back to 1858-59. 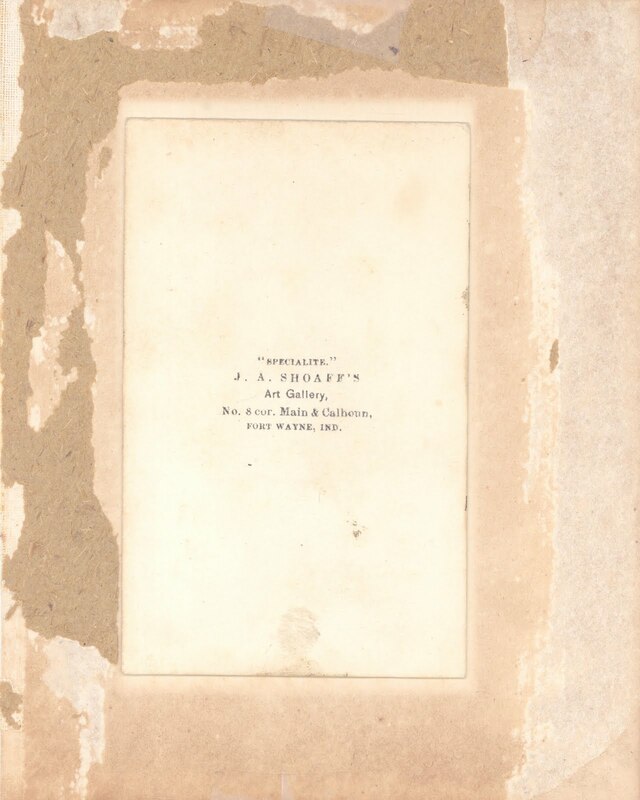 From these sources it was clear that John A. Shoaff, a well-known local photographer, was not in business in 1860. There are no directories of 1862-63 or 1863-64, but the directory for 1864-65 lists the Shoaff Gallery at the above address. By 1866, he had moved his studio to the corner of Calhoun and Columbia. Thus, we could establish that the photograph must date after 1860 and very likely from about 1864 or early 1865. Further research from John W. Miller's Indiana Newspaper Bibliography (1982) indicated that W. Henry Dills and I. W. Campbell acquired Dawson's newspaper in 1865. Perhaps the photo shows Dills and Campbell, with a third unidentified man, showing off their new purchase by bringing the bound volumes of the Times to the Shoaff Studio. We can't know for sure, but it represents an educated guess. This case study illustrates the sort of detective work historians, genealogists, and archivists must do when the caption of a photograph seems unreliable. Using other clues from the image itself and from the photographer's label, we can sometimes gain other useful information that differs sometimes from our first impression. John, what a great example of how historians can't take anything at face value but must do some exploring to know the facts. Most interesting.